The Big Muddy could soon be a bit greener with some hydrokinetic turbines from Hyrdo Green Energy. The Houston, Tex.-based startup tells us it is planning to have the first commercially operable hydrokinetic energy project in Mississippi River waters up and running by September. Hydro Green has agreed to sell energy from 250-kilowatt project to Xcel Energy through a power purchase agreement with the city of Hastings, Minn.
Hydro Green’s technology uses turbines with a 12-foot diameter; each one is capable of producing 250 kilowatts of power. A whole turbine array can be mounted on the bottom of a barge or platform with a gantry, allowing the turbines to be raised out of the water. That design eliminates the need for underwater mounting or maintenance, the company says. Hydro Green’s founder and CEO Wayne Krouse confirmed with us that once the turbines are up and running in the Mississippi, Hydro Green hopes to close a Series B round of funding in the neighborhood of $70 million (hat tip VentureWire). While Hydro Green is actively seeking Series B funds, the company wouldn’t confirm any potential investors. Likely candidates include previous investors such as David Gelbaum’s Quercus Trust, which led Hydro Green’s $2.6 million Series A round in April this year. Another possible backer is Acorn Ventures; the firm’s president, Stuart Schube, sits on Hydro Green’s advisory board. Hydro Green isn’t the only company looking to tap the Mississippi. Free Flow Power is a Massachusetts-based startup with a $3 billion plan to place thousands of small electric turbines down the Mississippi river — from St. Louis to New Orleans — which could generate more than 1 gigawatt of electricity. The startup has preliminary three-year permits to study 59 sites in the Mississippi, granted by the marine power gatekeeper, the Federal Energy Regulatory Commission. Beyond the Mississippi, Hydro Green is also working to generate power from ocean tides and currents, too. Earlier this week the startup announced an agreement with Wind Energy Systems Technology Group to explore the development of a hybrid offshore wind-hydrokinetic ocean current power project in the Gulf of Mexico. 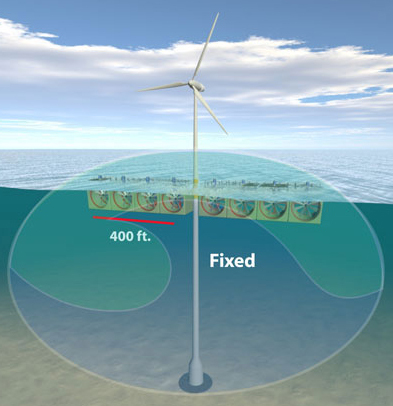 The basic idea makes a lot of sense — if you’re going to build an offshore wind turbine generating power above the water, you might as well mount some turbines underwater, since you’ve already got a pylon. I think it help maybe a little but we are poor in money with all these rising prices. how come I didn’t think of that before!It is truly a remarkable idea.Energy independence is only a shout away!